Donald Trump Jr. and Eric Trump are no longer listed as directors of a nonprofit that appeared to advertise a meeting with the incoming president in exchange for a $1 million donation. Paperwork removing their names from the Opening Day Foundation's list of directors was received and processed Wednesday by the state of Texas, said Alicia Pierce, a spokeswoman for the Texas secretary of state. A document filed last week had listed the Trump sons as initial directors of the nonprofit. It was not clear who filed the new papers. The organization drew scrutiny after TMZ posted what it called a "draft" of an invitation to an Opening Day fundraiser on January 21, the day after Donald Trump's presidential inauguration. The pamphlet advertised a "private reception" with Trump, as well as a hunting trip with Donald Jr. and Eric Trump, for sponsors who gave $500,000 under the Grizzly Bear package or $1 million under the Bald Eagle package. The pamphlet said the money would go to conservation causes. After the TMZ report, the Trump family began distancing itself. The Trump transition team released a statement Tuesday saying the reported details were "merely initial concepts that have not been approved or pursued by the Trump family." "Donald Trump Jr. and Eric Trump are avid outdoorsmen and supporters of conservation efforts, which align with the goals of this event, however they are not involved in any capacity," the statement said. 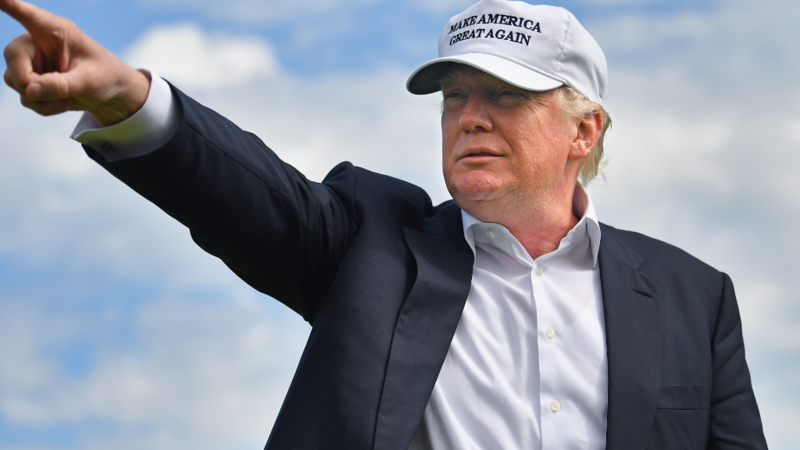 A new version of the pamphlet given to CNNMoney on Tuesday by the event's organizers did not include references to any meetings or photo opportunities with the president, nor the hunting trip with the Trump sons. 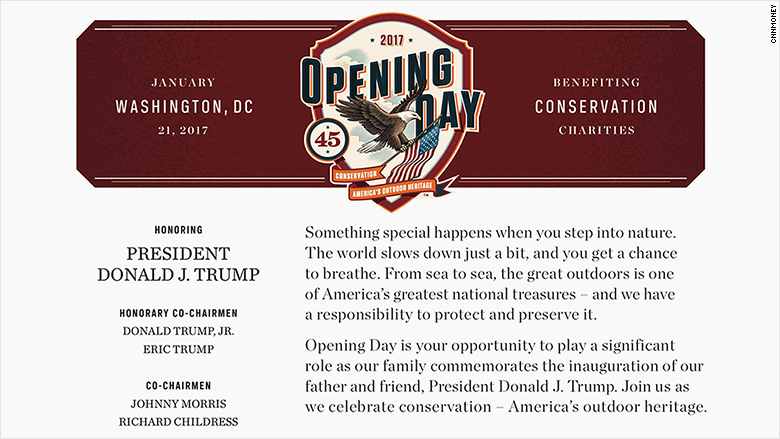 The new pamphlet still presents the event as "your opportunity to play a significant role as our family commemorates the inauguration of our father and friend, President Donald J. Trump." The Trump sons were also still listed as "honorary co-chairmen" of the event. Gentry Beach, a co-chairman of the event and a director of the nonprofit, told CNNMoney on Tuesday that to his knowledge, the sons were not involved in the nonprofit -- despite the fact their names were on the paperwork. Pierce, from the Texas secretary of state's office, said it was possible for someone to be listed on a nonprofit filing without their consent. Mark Brinkerhoff, a spokesman for the January 21 fundraiser, declined to answer a question from CNNMoney on Wednesday about any continued involvement by the Trump sons. The president-elect said last week that he will turn over managerial responsibilities of his business to Donald Trump Jr. and Eric Trump to avoid conflicts of interest. --CNN's Jeremy Diamond contributed to this report.